Head back to a powerful civilization and discover forgotten treasures in Ancient Egypt Classic slot by Pragmatic Play. 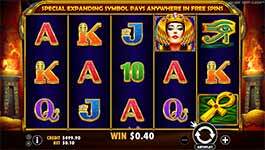 This fun 5-reel video slot boasts 10-paylines with an RTP of 96.47%. You'll find the powerful leader Cleopatra on the reels as the games high paying normal symbol while the golden scarab is a Wild Scatter symbol. Are you ready to unearth buried ancient treasures? Head back to a powerful civilization and discover forgotten treasures in Ancient Egypt Classic slot by Pragmatic Play. This fun 5-reel video slot boasts 10-paylines with an RTP of 96.47%. You’ll find the powerful leader Cleopatra on the reels as the games high paying normal symbol while the golden scarab is a Wild Scatter symbol. Are you ready to unearth buried ancient treasures? Wild Scatter Symbol – The Golden Scarab symbol acts as both the game’s scatter and wild symbols. It can substitute for all symbols in this case. Landing three of these symbols anywhere on the reels will pay 2x your total bet while landing 5 will earn 200x your bet. In addition, when you hit 3 or more scatters you’ll win the free spins bonus game. Free Spins Bonus Game – Land three or more Golden Scarabs anywhere on the reels to win the free spins feature. First you’ll be awarded with 10 free spins with a randomly selected special expanding symbol. This special symbol pays according to the paytable on all reels but will expand vertically to cover all three positions on the reel when hit.